Took a snowy walk up Camaderry, over to Turlough Hill, down by the Glenealo River , through the Miners Village and back to Glendalough. A super day, below zero throughout with soft lying snow. Some ice in places and a little spindrift from time to time. 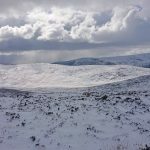 Full winter kit and supplies required, snow shoes a must.